Stunning original look with such a quirky edge.You look fabulous Sis masha'Allah. Beautiful girl MASHALLAH, you looks awesome! I love it - and love the choice of red, white and blue coloring (on purpose?! 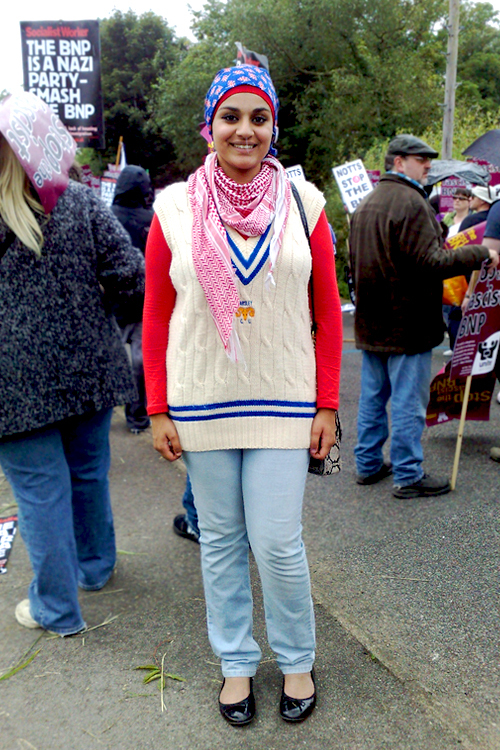 )..nice one..make a stand against BNP hijacking our flag and country..
a cricket v neck! - very British! please can tell me where u got ur top blue head scarf/bandana ... that is my favorite bit. Thats what you call style!! the cricket jumper and the primark shoes. I want to copy this look!